Remember the chaos of the Muppet Theater from The Muppet Show? Dr. Bunsen Honeydew's inventions running amok, the Swedish Chef being attacked by his ingredients, Miss Piggy making demands for her closing number, The Great Gonzo's act onstage literally bringing down the house, and Kermit the Frog was backstage keeping everything running as smoothly as possible. That's the type of classroom I want to have. Jim Henson talked about the "gentle anarchy" of his work. I think that's just the thing our classrooms need. Jim Henson would have turned 78 years old last Wednesday. I've loved his work for as long as I can remember. Some of my earliest memories are of laughing with my grandpa as we watched The Muppet Show. I played my Muppet Show Cast Album records so much growing up that I nearly wore out the grooves. When I had to pick a name for my high school German class, I chose Kermit. The area behind my desk is a gallery of Muppet photos and a picture of Statler and Waldorf hangs on the wall where I can imagine them heckling anytime I stand at the front of my classroom and lecture too much. What does Jim Henson's work mean for me as a teacher? First, his work had an enormous influence on my sense of humor. There's a good chance that Sesame Street was the first thing I watched on TV. Even today, the episodes from the early 1980s are very funny. The gentle anarchy of a neighborhood inhabited by children, adults, a giant bird, and friendly monsters is a prime environment for comedy. It wasn't long before I discovered The Muppet Show and really began to understand what made me laugh. The way Fozzie Bear tries too hard to make others laugh, Sam the Eagle's complete, stone-faced seriousness, and Gonzo's nonsensical stunts created my comedic vocabulary. The Muppets taught me teamwork. All the residents of Sesame Street help each other out. And even though every production in the Muppet Theater nearly results in disaster, they all pull together for a show-stopping closing number. But that teamwork pales in comparison to what was going on under the Muppets. Jim Henson assembled an amazingly collaborative team. Everybody played to their strengths whenever possible, but took risks to create new, exciting things together. I aspire to that level of collaboration with my students and my colleagues. Nothing teaches the value of individualism and diversity like the Muppets. Every pig, chicken, and monster has something wonderful to contribute. The same is true of every child in my classroom. I want my students to explore their own passions, to tackle problems from their unique perspectives, and share who they are with the class. Giving students choice often results in a classroom full of gentle anarchy, and that's the way I like it. 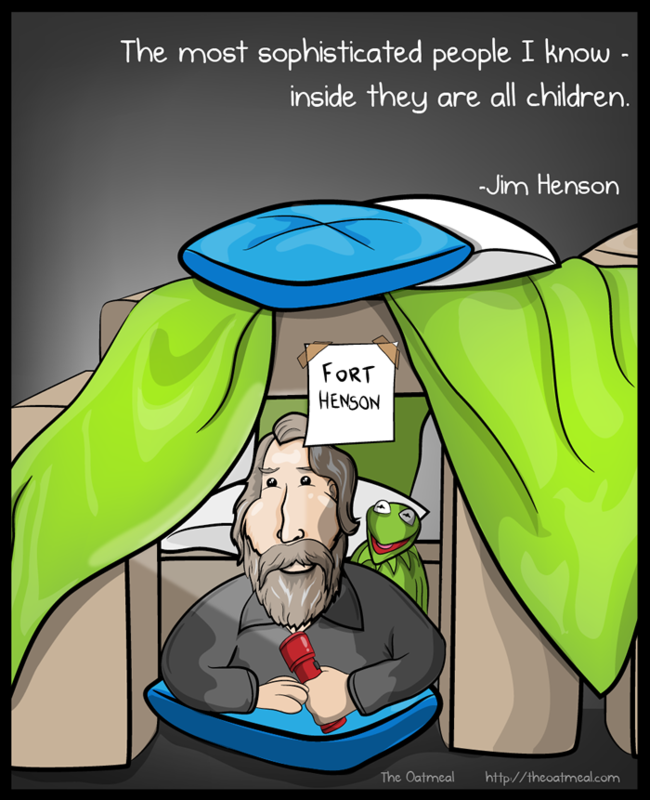 Finally, loving Jim Henson and his work helps keep me in touch with my inner child. How can I teach a seven-year-old if I can't laugh at the same things that make her laugh? To be an effective teacher, I need to remember what it's like to lose myself in wonder - to believe that animals can talk and a frog and a pig can fall in love. Being able to connect with my students in that way helps me build rapport. As I sit here early on Sunday morning in pajama pants decorated with wide Muppet smiles and wearing a Kermit the Frog T-shirt next to Muppet representations of my family sitting on the mantle, I know Jim Henson had an outsize influence on who I've grown up to be. I'm thankful for what his work has done for me and I aspire to pass on some of that gentle anarchy as I laugh and learn with my students.